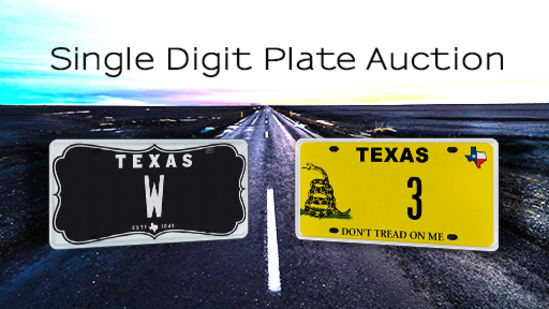 My Plates Single Digit Auction: Two incredibly rare Texas license plate messages, each only a single character! 5-year term, renewable & fully transferable. Pick from 100+ eligible plate designs. Payment Instructions: Winners of Lots with hammer prices of $25,000 and less will have the credit card on file charged immediately after auction concludes, please ensure your card has adequate capacity to address your bid amount. Please call 888-769-7528 on the following business days between 8a-5p to select your background design and confirm owner/shipment information. Winners of Lots with hammer prices above $25,000 will have the maximum amount possible taken from the credit card on file, and winner must then contact My Plates at 888-769-7528 between 8a-5p within 3 full business days of auction close to complete payment of any remaining funds or risk losing right to the Lot. Shipping Instructions: Please contact MyPlates.com for general shipping and handling information. Email auction@myplates.com or call 1-888-769-7528. Preview Date & Times: Please contact MyPlates.com for preview dates & times. Email auction@myplates.com or call 1-888-769-7528. Checkout Date & Times: Winners: Lots must be fully paid within next 3 business days, either by credit card or other arrangements. Please contact My Plates at 888-769-7528 8a-5p within next 3 business days of close of auction or risk losing right to Lot. Driving Directions: Auction is online only. Winners of Lots with hammer prices of $25,000 and less will have the credit card on file charged immediately after auction concludes, please ensure your card has adequate capacity to address your bid amount. Please call 888-769-7528 on the following business days between 8a-5p to select your background design and confirm owner/shipment information. Winners of Lots with hammer prices above $25,000 will have the maximum amount possible taken from the credit card on file, and winner must then contact My Plates at 888-769-7528 between 8a-5p within 3 full business days of auction close to complete payment of any remaining funds or risk losing right to the Lot. In some states, the first three single-digit numbers are reserved for government officials, for example "1" for the governor, "2" for the lieutenant governor, and "3" for the secretary of state, and therefore are not available to the general public. In Texas, My Plates is making a low-digit number available to you! There are only nine single-digit number plate messages possible, 1 through 9, and "3" is rare, unique and up for bid. As this may be the only time "3" is ever available, this may be your only chance ever to secure it. Proudly display "3" on any of the 100+ eligible My Plates background designs. Winners of Lots with hammer prices of $25,000 and less will have the credit card on file charged immediately after auction concludes, please ensure your card has adequate capacity to address your bid amount. Please call 888-769-7528 on the following business days between 8a-5p to select your background design and confirm owner/shipment information. Winners of Lots with hammer prices above $25,000 will have the maximum amount possible taken from the credit card on file, and winner must then contact My Plates at 888-769-7528 between 8a-5p within 3 full business days of auction close to complete payment of any remaining funds or risk losing right to the Lot. Plate is a 5-year term, renewable, and is fully transferable. Owning one of twenty-six of anything is a big deal. And that's what bidding on and winning the single-character plate message "W" will be. Single-character plate messages are exclusive, unique and clearly extremely limited. You winning "W" would make you as unique as it is. As this may be the only time "W" is ever available, this may be your only chance to secure it. Proudly display "W" on any of the 100+ eligible My Plates background designs. You've been outbid by J****5! by YOU!